Are you searching for a Digital Delay stomp box that delivers great sound and outperforms the competitors when it comes to sonic quality? Pick up the Rocktron Reaction Digital Delay and surprise everyone, including yourself! Rocktron’s Reaction Series pedals are built into a rugged metal slim form factor chassis, taking up as little space as possible on your pedalboard. The Reaction Digital Delay is a TRUE BYPASS pedal: when you turn it off…it is out of your signal path! The Reaction Digital Delay is very easy to use. Controls include LEVEL, which controls the output level of the effect. MODE determines whether the Delay time range is Quick (62.5 ms – 125 ms) or Extended (125 ms – 250 ms). REGEN controls how many echoes you hear, while TIME controls the Delay Time selection. 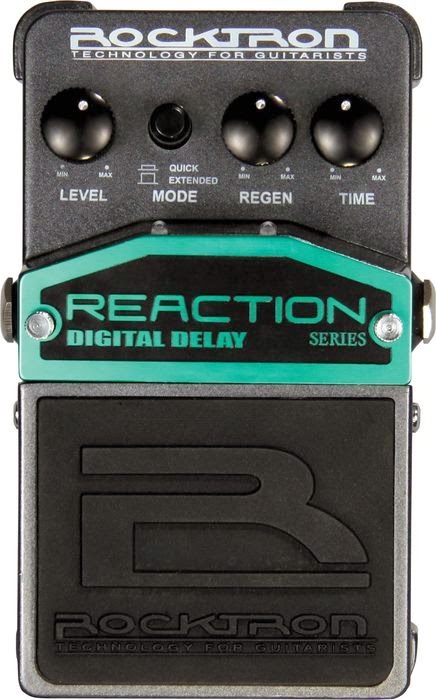 The Reaction Digital Delay has all the smooth full bodied tone you expect in a delay pedal. If you are a rocker, we’ve got your back! Just set the Reaction Digital Delay mode to Extended, then turn the Time control to find that classic rock phrasing echo. Country pickers or Rockabilly jammers, set the Reaction Digital Delay mode to Quick and dial up your favorite slapback! Most players find that delay pedals will sound better when placed after distortion. If you are using a distortion pedal, place the Reaction Digital Delay after the distortion pedal in the signal chain. If you are using your amplifier’s distortion, place the Reaction Digital Delay in the effects loop section of the amp, (making sure to follow the instructions in your amp manual when using the effects loop). The footswitch on the Reaction Digital Delay controls On/Off status as shown by the LED indicator. Reaction stomp boxes run on a 9V Alkaline battery, or may also be powered by Rocktron’s DC OnTap Universal Power Supply adaptor.